A big case makes for strange bedfellows for retrieval specialist Jeremy Wilderson. Sixth-grader Jeremy has been retrieving (not stealing) items around Scottsville Middle School all school year; it’s not thieving if you are returning materials, whether stolen by actual thieves or confiscated by teachers, to their rightful owners. School detective and fellow sixth-grader Becca Mills does not agree and dogs Jeremy’s every step. She just can’t get enough evidence to nail him. Then Mark, an eighth grader, tricks Jeremy into taking the master locker key from the janitor’s room, telling Jeremy it’s his own lost key. Jeremy can’t involve his hacker friend or his forger friend (both of whom also work only for the good of the students) for fear of getting them in trouble, so whom can he partner with to take down Mark before Mark implicates him in the theft of the key? Surely not law-and-order Becca…but desperate times call for desperate measures. 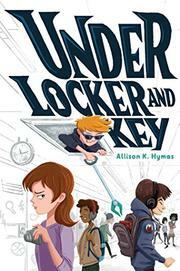 Hymas’ debut is entertaining caper fiction. Jeremy’s genuine and at-times charmingly jokey voice will engage fans of Gordon Korman’s Swindle series. The structure of the tale might be familiar, but the details and the realistic kids bring it home. Jeremy and the other principals seem to be white, but the secondary cast is multiethnic.